Using the Ozeki Phone System XE on your server, it is possible to provide SMS service for your customers. 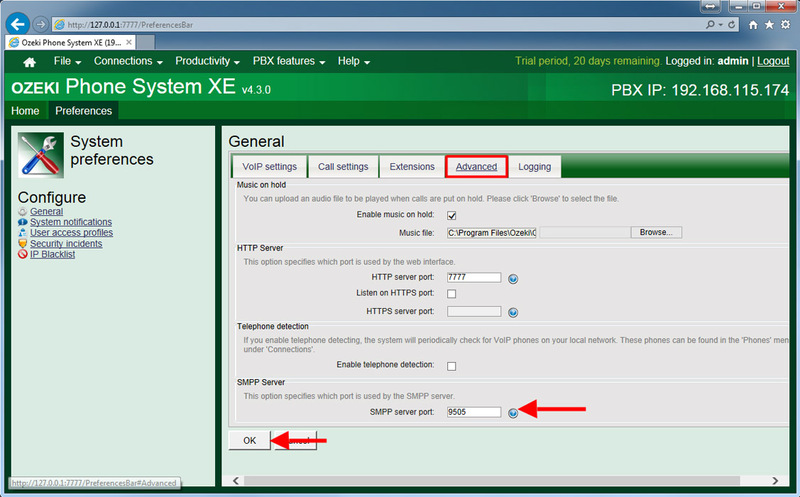 Your customers can connect to Ozeki Phone System XE over the SMPP protocol using the SMS Extension of the PBX. In this guide you can read about how to install and configure an SMS Extension in your Ozeki Phone System XE to provide SMPP Service. In this step you can see how to configure Ozeki Phone System XE to provide SMS service for your customers. 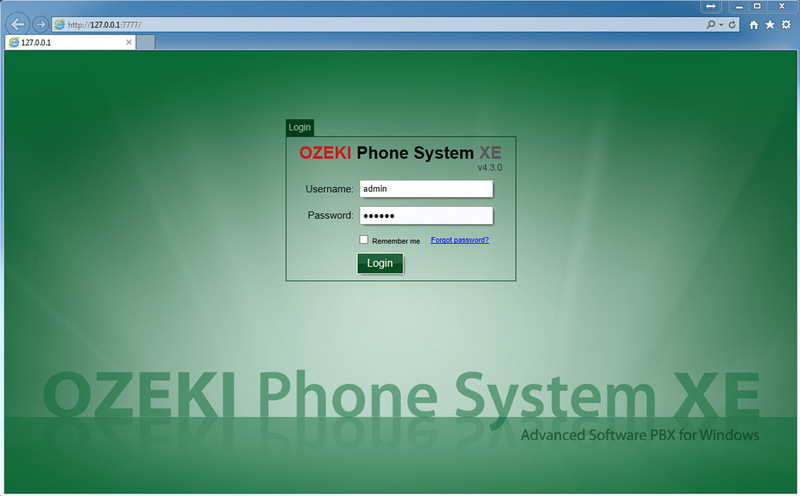 First open a web browser and login to your Ozeki Phone System XE (Figure 1). On the main screen find the Extensions section and click on Add button (Figure 3). On the next page click on Install button to add a new SMS Extension. 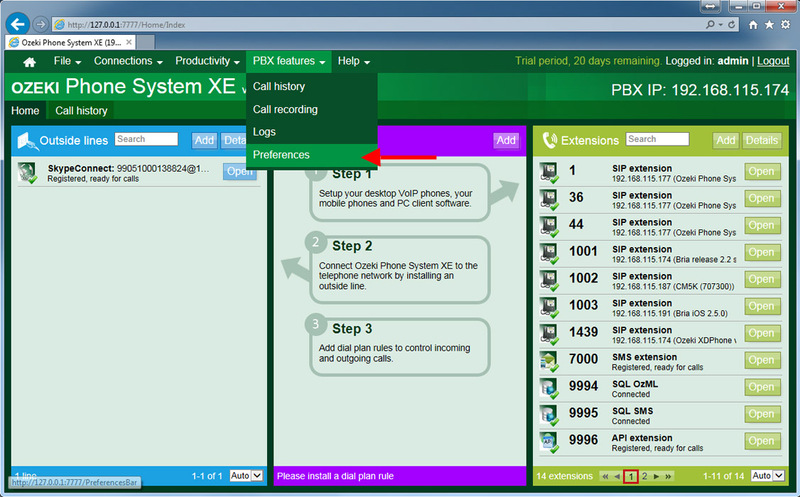 Using this extension, SMPP clients can connect to Ozeki Phone System XE. This extension allows you to send and receive SMS messages. In addition, it also handles SMS submission reports and SMS delivery reports (Figure 4). 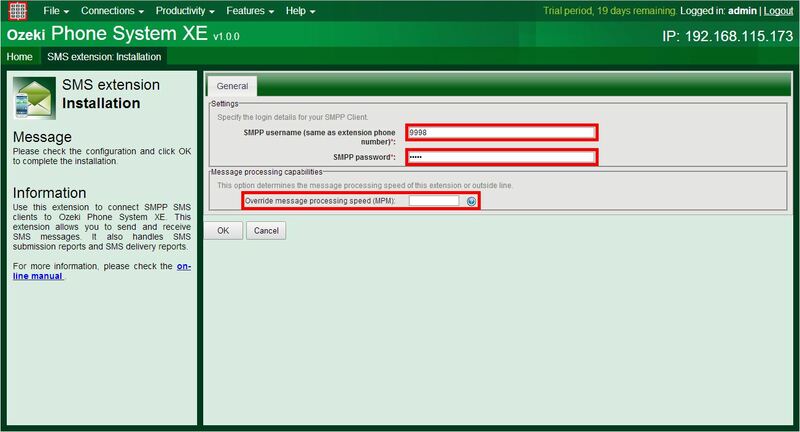 Then you have to provide a username and password will be used by an SMPP client to connect to Ozeki Phone System XE. The other application needs to use the IP address of Ozeki Phone System XE, the 9500 port number and this username and password. If you check the "Delete messages that were processed by an extension or outsideline", the messages will not be stored in the system if they are processed (Figure 5). You can customize the message processing capacity separately for each message sending component within the capacity of your software license. Here you can find a detailed guide about this and the message handling in Ozeki Phone System XE. 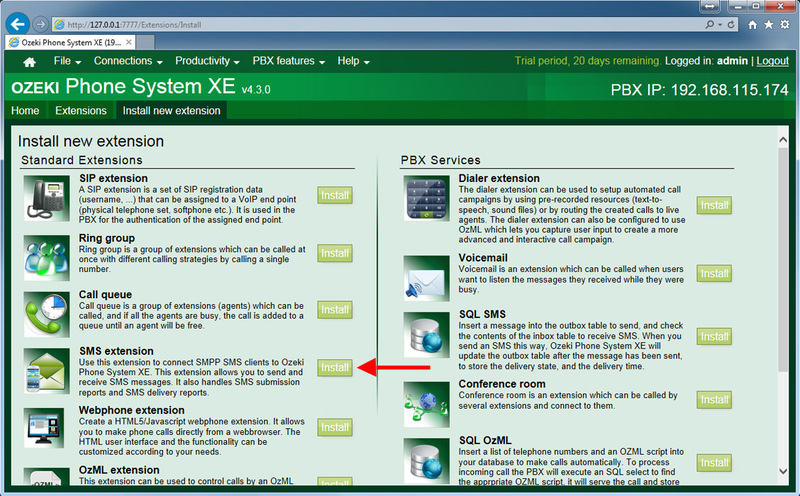 If you click on Ok button, and an SMPP Client connects to the Ozeki Phone System XE, you can see (under the Log menu) that the connection state will become to StateConnected. This means the connection has been built successfully. If you have an other application that uses the 9500 port number, it is also possible the change the default port number in your Ozeki Phone System XE. First click on PBX features menu and then select Preferences. On the next page, select Advanced tab, and change the default port number in the SMPP Server port textbox. Then click on Ok button to save the settings. If you have any questions or need assistance, please contact us at info@ozekiphone.com. If you would like to make and receive messages, you will need to set up routing rules for this purpose within the Dial plan panel. You can handle messages from all sources and destinations (for example: Email providers and SMS Modems). You can read more about call routing for messages here.